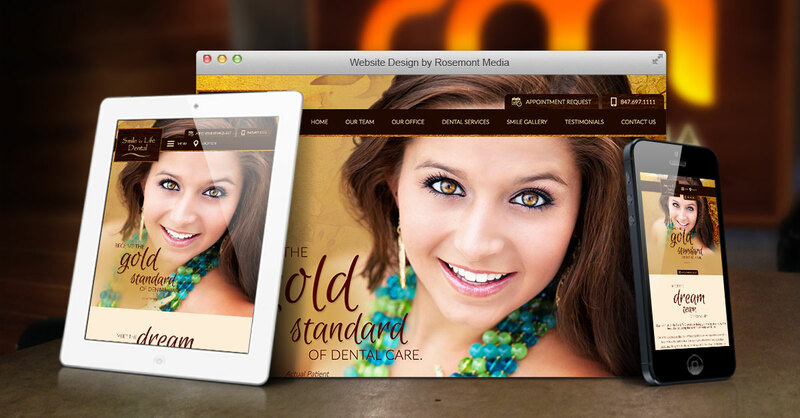 When established Elgin dentist, Dean Lodding, DDS recognized a need to revitalize his practice’s website, he reached out to Rosemont Media. The main goals that were expressed for improving the Smile for Life Dental website included warm tones to be reflective of the office, a simplified navigation, and multiple educational videos for new and prospective patients. Our team sought to incorporate these key objectives for the site to help viewers feel a sense of comfort and confidence with the practice’s many services. Modernizing the site’s functionality was important, and by designing a logical breakdown of tabs with drop-down menus, the site became more user-friendly. Developing a responsive website design was also a priority in order to make it accessible across numerous platforms, including tablets, mobile phones, laptops, and desktops. The custom website includes detailed treatment information, along with a frequently updated blog, and patient video testimonials. An image slider bar of before-and-after photos is one stand-out, as well as a unique “In The Media” page which portrays newsworthy recognitions and showcases celebrity Jenny McCarthy’s informative videos about the office. Additionally, Dr. Lodding’s website has implemented advanced SEO tactics to improve website visibility and now boasts a beautiful new design illustrated through earthy gold and brown tones. Experience the detail and unparallelled service that Rosemont Media offers by visiting www.drdeanlodding.com.